¡Feliz Navidad! ¡Glædelig Jul! ¡Merry Christmas! to all my friends and readers. May you enjoy a peaceful and loving holiday with family and friends. 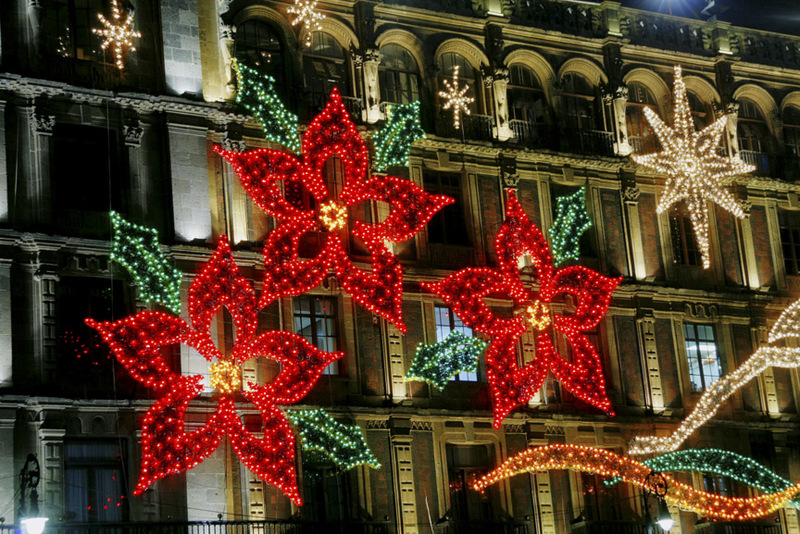 I thought I’d post a few pictures from Mexico City’s Zócalo, showing the holiday decorations. Unfortunately, I am not there, but these pictures are from years past, and the decorations change little from year to year. I’ll also write a little bit about my family’s own, Danish Christmas traditions. 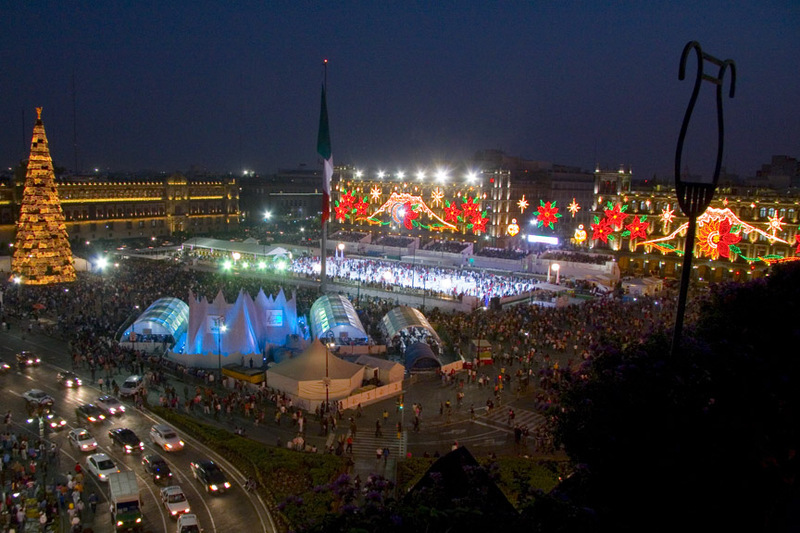 Typically the city installs an ice skating rink (pista de hielo – very suitable for the tropics), and festoons the various government buildings with myriad decorations showing things like the snow-covered volcanoes around the city including Popocatépetl and Iztaccihuatl, poinsettias, piñatas, gifts, candles, and other symbols of the season. The electric poinsettias (or Noche Buenas) are beautiful. I’ve always thought the shot below would make a nice Christmas card if I could ever get around to having them printed. 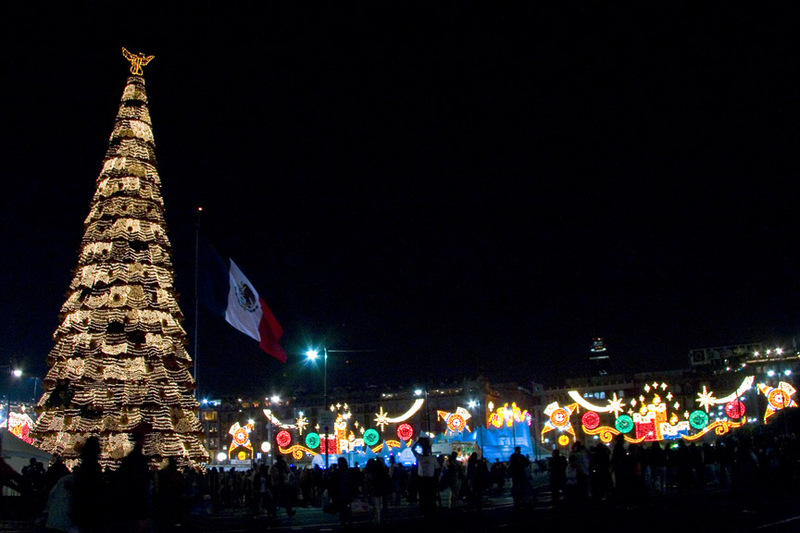 And of course, no Mexico City Christmas display would be complete without a perfectly conical Christmas “tree.” As you can see, the Zócalo is thronged with people. Meanwhile, I’m near San Francisco, enjoying a sunny, 70° day. Later, I’ll join my extended family for the first of several Christmas celebrations. Due to our Danish heritage, we celebrate Christmas on Christmas eve, with a very traditional dinner of roasted goose, red potatoes, pickled red cabbage (not unlike sauerkraut), and the most traditional item of all, riesengrød, (pronounced ree-sen-grodth) a warm rice pudding. Each person gets a serving, and one lucky person will find a blanched almond. The finder of the blanched almond gets a special, small gift like a box of chocolates, or marzipan, or something similar. Part of the game is trying to guess who’s got the almond. The person who discovers it is supposed to keep it a secret as long as possible, and there are many rounds of joking around about who has it, who has won it too many times in the past, who’s never won it, etc. It’s a simple, but fun tradition. We eat the riesengrød with a pat of butter and cinnamon sugar. It’s a first course, as Denmark wasn’t always a rich country, and it is filling, and cuts the cost of the Christmas dinner. Now, of course, it’s not to save money, but a fun tradition. We usually also have a separate almond and gifts for the kids too. Our tree is also somewhat different. Instead of lights, we use candles. But we only light them once, and once lit, we have a fire extinguisher at hand, sing our carols around the tree, and then blow out the candles. Fortunately we’ve never had a fire. Some Danes have “flex-fuel” trees with electric lights too. The tree is also decorated with hand-made decorations. Danes traditionally weave little paper hearts out of shiny colored paper, and also little cones. We hang these on the tree, sometimes with hazel nuts inside to give them shape and weight. 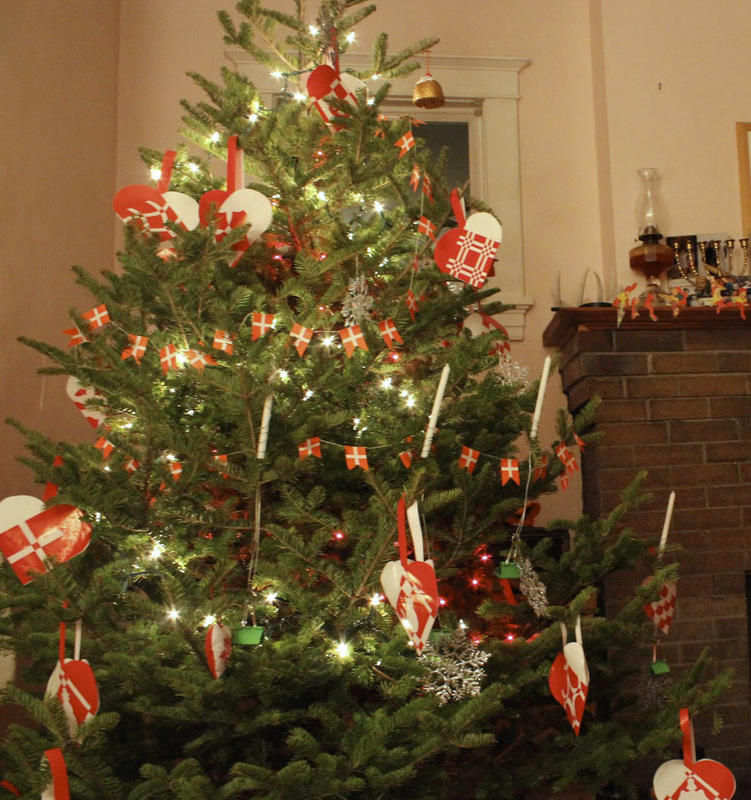 We also have streamers of little Danish flags for the the tree. So I’ll soon be heading out to join the rest of the family at my sister’s, where I also get to meet my youngest nephew for the first time. (He was born right after Christmas 2012). I’ll catch up with my parents, and see the rest of my siblings too. It should be fun. I wish you a happy Danish-American-Mexican Christmas!!! What are some of your special traditions? I’d love to hear about your Christmas traditions. If you write such a post, I’ll definitely read it. Here at my brother’s the internet is a bit unreliable and slow, so I can definitely sympathize. Thanks for commenting! Saludos. Big, beautiful, fresh snowflakes fell for a some time on Christmas Eve here, and it became a true winter wonderland. The tips of the pine trees outside looked as if they had been carefully painted and with the reflection of the colored lights on the houses, it made for a gorgeous scene. I enjoyed reading your post and love the electric poinsettias photo. Hola John! Merry Christmas. Yeah, the whole “winter wonderland” thing also seems a bit absurd here in CA where it’s sunny and 70°. And yes, world peace now would be a good thing. Thanks for commenting. My tradition? Watching Life of Brian on Christmas Eve to remind me that the faith is deeper than ritual. Hold it! Isn’t watching something each year a ritual in itself? It is from this that wars are born. I hope you have a great Christmas. And a blessed new year. I have to say, Steve, that one of the things I admire about you is your ability to have a very deep faith, deep enough to be able to laugh at something like Life of Brian, without it upsetting you. Apparently, the film was essentially banned in Norway and Ireland for decades, as well facing trouble getting showings even in Britain. As for my Christmas, it’s already been wonderful, and there’s another full day tomorrow, and then later in the week with my birth mother. Thanks for commenting. Very interesting post. 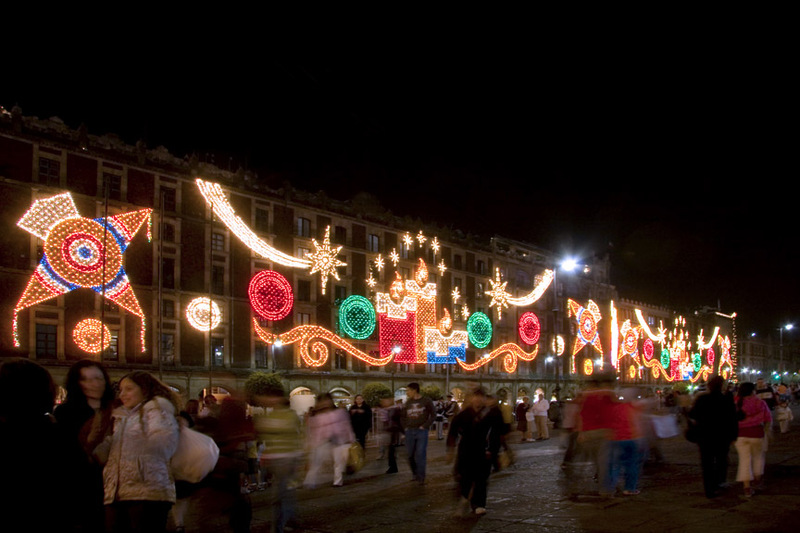 I’ve never been in Mexico City for Christmas as when I was working there I was always gone by the 15th of December. Maybe next year…….. I have to say, I’ve never tasted the Mexican bacalao, and only recently realized it was prepared from salt cod. But I’m dying to try. One of these days. Thanks for commenting, and I wish you a very Merry Christmas. Wow! You really do have a multi-cultural Christmas. I’d love to learn more about it. Merry Christmas, and thanks for commenting. Merry Christmas Kim, also to your family. I grew up in Holland where Christmas is mostly a relgious celebration. Gift giving is on December 5th the birthday of saint Nicolas, a Spanish bishop, who along with his helpers, known as Black Peters, would give gifts to the good boys and girls. Merry Christmas, beautiful tree, I was watching a program where it discussed the history of the tree and the candles, and here you go the next day you have a picture of one, I can just imagine the ambiance of the candles…. The tree is very special. Obviously, we can’t just light it and do something else, so it kind of focuses us all for a time on the Christmas spirit and the beauty of the season. Thanks for stopping by. Merry Christmas! Have a wonderful time with your family and I hope we can connect either in Mazatlan or Mexico City sometime next year! Hi Nancy, It’d be so cool to meet you and Paul. I hope you have a wonderful Christmas. Cool post. I enjoyed the Zocalo pics, I was just there during the day and before the rink was setup. I also love the Danish almond tradition 🙂 Never heard of it. I hope you can have Christmas where you are. Felicidades! And thanks for stopping by. Unfortunately, not this year. 😦 But there’s always the next. Thanks! My mother was Norwegian so we celebrated Christmas on Christmas eve as well. Family gifts were opened but Santa’s Stocking was left for Christmas morning. Gravlox was also on the menu for Christmas Day. Have a very Merry Christmas, Kim. We do it the same. Gifts opened on the 24th, stockings on the 25th. With my in-laws and extended family, we now basically have two Christmases. May yours be happy and best wishes for a happy new year!